“Muri e divisioni” (“Walls and divisions”) is the title of the Macerata Opera Festival 2013. An edition completely devoted to the opera composer Giuseppe Verdi to celebrate the 200th anniversary of his birth. A call for artists was organized by Adam Accademia delle Arti, a local no-profit organization composed by 40 artists, to collect proper artworks for the exhibition. An augmented reality (AR) experience was planned to engage visitors with Verdi’s music, from Nabucco and Il Trovatore. The event exhibition “Muri e divisioni” took place from July 18th to September 29th 2013 in a Gallery called Palazzo Galeotti located in the city centre. To live the augmented reality performance, 7 auras were made. Two musical paths were created: one was based on “Dio di Giuda”, “S’appressan gl’istanti” and “Va pensiero” from Nabucco; another “Di quella pira”, “Tacea la notte placida”, “Terzetto Anima mia!” and “Stride la vampa” from Il Trovatore. The music augmented 7 artworks of the painters: Simona Breccia, Hernàn Chavar, Dorian X, Gabriella Gattari, Luna Simoncini, Marco Temperini and Tomas. The augmented reality has been created to make visitors perform a unique experience in a contemporary art gallery. The public may dynamically live something special, while appreciating paintings and installations. Giuseppe Verdi’s music augments pieces of art and specific gestures appear at the same time. The visitor has to abandon his/her apathy to perform something unexpected and to enjoy the two itineraries. 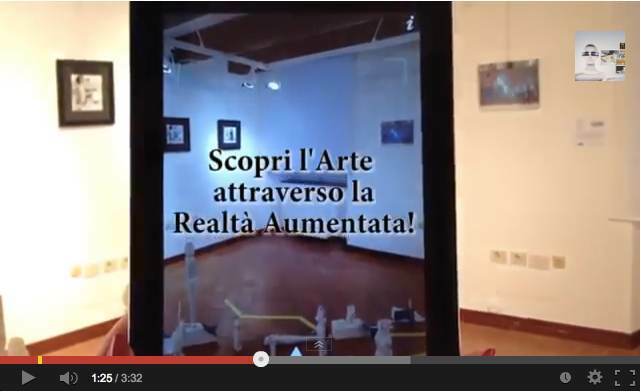 The augmented reality experience was designed and realized by Mirco Compagno (AR techno-scientific researcher) and Giuliana Guazzaroni (AR researcher) for Adam Accademia delle Arti. The artists weren’t been advised about the augmented reality that modifies their works. Some painters were enthusiastic, other showed attention in the experience and one wasn’t completely satisfied by the selected music for his canvas. The public reacted in different ways. In general, they were amazed and engaged by the first performer, a person that modelled the AR experience for visitors, and participated to the experience. Moreover, an ex-post questionnaire was distributed to 50 users in order to collect useful information for the evaluation. Most of the participants declared to have truly enjoyed the AR performance (60%); 20% said to have enjoyed it and 20% declared to have hardly enjoyed it. For 48% of the public the activity performed highly promoted an emotional bond with contemporary art. For 36% of the visitors the activity performed promoted an emotional bond and for 16% scarcely promoted it. Most of the visitors declared that they would really recommend AR experiences to other people (68%); 16% would warn such experiences and 16% would hardly recommend them. As for technological difficulties, most of the public could easily enjoy the performance (80%), while 20% declared to have encountered problems using the AR browser in their smartphones or tablets (e.g. obsolete operating system etc.). An interviewed visitor said: “it was engaging and exciting to participate in the exhibition “Walls and divisions” that allows people to deal with art in a different and touching way. Thanks to AR there is no longer a simple contemplation, but a real opportunity to experience the exhibition as a whole. Moreover, it becomes a real chance to share feelings with other spectators. A new way to enjoy contemporary art merged in a new surreal dimension”. “Background of an AR experience” di Giuliana Guazzaroni – THE ROUND è distribuito con Licenza Creative Commons Attribuzione – Non commerciale – Condividi allo stesso modo 3.0 Unported.